Ever feel like you were born in the wrong time - like you should have been born earlier, when the music was... real? No. Earlier... like the early seventies. 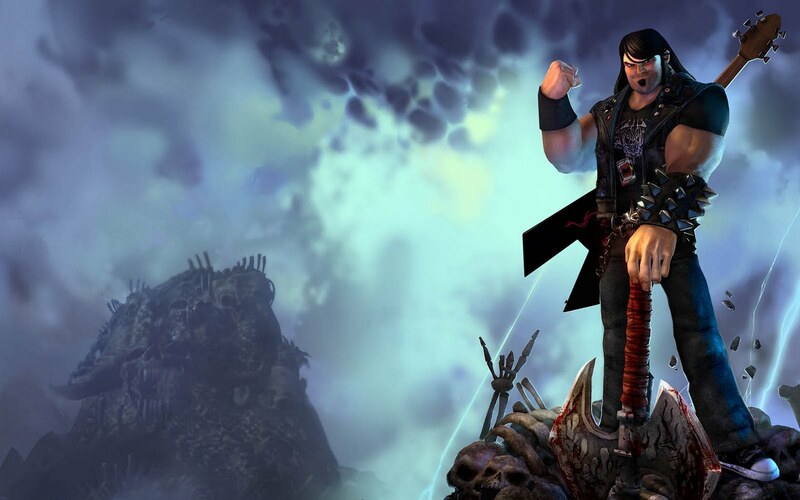 The big draw for Brutal Legend for me was the theme: an homage to the heavy metal of the seventies and the early eighties, starring Jack Black, who before he became a household name was already doing this type of homage with his Tenacious D act. And if you're in the target audience and you've never seen it, I recommend digging up a Tencacious D concert... and don't be put off if you were unimpressed by the Tencacious D movie from a couple of years ago. Getting back to the game, I noticed that Jack Black's character, "Eddie", bore a resemeblance to the character of Eddie from the Rocky Horror Picture Show. Eddie in RHPS was played by Meatloaf, who happened to play Jack Black's father in that Tenacious D movie. Coincidence? So I'd played the demo awhile back, and it seemed like a good action game in the God of War style. Thought it a little odd that he couldn't jump, but whatever. So there's a lot of getting to know the story, my car, getting to know my abilities. I'm sent into a mine to free some headbanging slaves, who become my army. Interesting twist, but controlling them wasn't as fun as I would have hoped. Then they set me loose in the sandbox. Oh, there's a sandbox! I go to do the side missions, but they weren't much fun. I quickly conclude that this is the crappiest sandbox ever. Back to the story, then, and I do some missions where I'm recruiting more people to my army, and eventually have what the game calls a 'stage battle'. In addition to my headbangers (grunts), I now have some girls with projectile-firing guitars (archers), and some bikers who seem to heal. Oh, so this is kind of a real-time strategy stage. It's not that much fun though. At this point, I've unlocked access to the Guardian of Metal (Ozzy) who will allow me to do upgrades. They seem to be pushing upgrading my car, but I didn't really see the point, so I upgraded my character's abilities instead. And now, my next mission was to use my car to protect our tour bus. *bleep*. All I really had to do was hold down the shoot button, and as long as the enemies were on the screen in front of me they would go boom, but having not pimped out my car I couldn't destroy them fast enough to protect my tour bus, and I had no option to go back and change my upgrades. At this point I almost quit the game, came back, and reported to you all that Brutal Legend is a game that has a cool theme, but tries to do too many things and doesn't do any of them well. But having gotten annoyed and quit three games already in like just the last month, I decided I was going to go back and give this game a couple more hours. And I'm kind of glad I did, because I finally realized what they were trying to do. This is what you need to understand to appreciate the gameplay: it's a real-time strategy game, and everything else is just training and/or window dressing. My first actual stage battle didn't impress me, but as I got more units and abilities, it got more interesting. I suppose the biggest problem with knowing that going in is that it's going to take you several hours before you get to the point that you actually feel like you're playing an RTS. That first stage battle would've been the second level in a regular RTS. Oh, don't play this if you're looking for God of War action. Setting that aside and judging it on the merits of other RTS's.... I like it, but I don't love it. For those who have played games like Starcraft, the unique aspect here is that you are actually on the battlefield giving orders. The cool part is that you're in the battle whacking things with your axe and able to tag-team with your units to do special moves. The uncool part is a lack of control. I wasn't always sure who my units were without doing an aoe attack and seeing who was standing, and directing them around was something i just wasn't getting the hang of. Sometimes I didn't realize that I was all but alone on the battlefield until I pulled up my unit building screen. In the end, I'm too used to being a god-figure in RTS's, and didn't appreciate the limitations of being a general on the battlefield. But it was a new experience and there's a general lack of RTS's on consoles, so this game was worth the time for me, especially when you factor in the metal theme. I do have one minor complaint where the theme fell short, and that was the art style of the characters. I would've liked an art style that was a bit more of a throwback to the 70's. It would've set the game apart even more. I'd rate this game three stars for gameplay, and throw it an extra half-star for the theme and all-around creativity. 3.5/5 stars. I bought this on launch, played for maybe 2 hours then just stopped. Oddly enough this morning i was just thinking about how i need to pick this back up. I loved the overall theme. No idea why i just stopped though, maybe cause MW2 came out. Ahhh, yes... I used to think how cool it would have been to be in the prime of life back in the 70's...but then I remembered there would be no internet, no DVD players, and the 70's Diet Pepsi had a terrible after taste. hah nice review, sounds about right. +followed. I personally feel I was born in the wrong era. I never got to find out what a world without internet and cell phones was like. A very decent review! And a bit of a shame that those issues brought it down so - remember being really excited for the game, too bad it turned out to be not-so-hot. nice review thanks for sharing. I wish I had been born in the late 40's, then I would have the 60's and the 70's to enjoy as an adult! nice review tough. heavy metal ftw! Couldn't really get into this game.